The Intergovernmental Panel on Climate Change (IPCC) recently released a special report on global warming of 1.5ºC, which underscores that actions to limit greenhouse gas emissions have been too little and too late. Yet many projects of adaptation still take the view that with just a few small tweaks, existing livelihoods and lifestyles can be adjusted to meet the challenges of climate change. This column makes the case for true acceptance of what is happening. Life will change dramatically for many – and that has powerful implications for the path of development and human wellbeing. When I lived in Ho Chi Minh City in Vietnam, and complained how warm I felt, a European acquaintance who had already been there for years suggested that ‘one adapts’ to the hot and humid climate. She then went on to be shocked when I mentioned that I didn’t have air conditioning inside my house. ‘It’s the first thing I turn on when I enter a room’, she said. So how did that make her adapted to the sticky climate? Air conditioners are the type of quick fix that people seem to want in order to adapt to a changing climate. They offer a chance to continue in familiar lifestyles, which for most northern Europeans includes cooler and dryer weather. But air conditioners do not actually make people adapt. In fact, they might even make it more difficult to face the real climate outside because of the contrast between dry, air-conditioned air and warm, humid air. This exchange prompted me to reflect on what actually constitutes human adaptation and what is just an action that people take to avoid adapting? It struck me that there is a missing dimension to current discussions of adaptation in science, policy and particularly practice – namely, ‘acceptance’. Acceptance has to play a much more important role in lifestyles over the next few years. Like it or not, the climate is going to change in ways that will challenge many things that people around the world enjoy for their entertainment, in addition to things that are necessary for survival. Acceptance is described in the book The Environment as Hazard, first published in 1978. In the approach of authors Ian Burton, Robert Kates and Gilbert White, acceptance is considered to be one of the four modes of coping with natural hazards, alongside absorption, reduction and change. Acceptance is important because it means that people have to face up to what is happening. In the context of migration being touted as an adaptation strategy, there seems to be an assumption that people can embrace living in a new location, rather than preferring to live their lives as before. I am not trying to suggest that a dramatic change such as migration is not a must for some people and a very useful strategy for many others. But how many people are really willing to leave their homes, their countries and their networks behind as a first choice? On another level, how many people can willingly accept the possibility that there may be fewer employment options in the future because climate change has made certain jobs impossible or non-existent? A 2010 study tackles adaptation from the perspective of integral theory, which underscores the importance of ‘interior’ changes – in this case personal and cultural changes that are necessary in the face of climate change. But acceptance goes beyond individual consciousness about climate change. It also has implications for investment approaches. Should people accept climate change and move into different livelihood strategies that are less sensitive to the climate? Or should they invest in activities that are threatened by climate change and try to make them less sensitive? Agriculture is the most pertinent example, especially for smallholders whose productivity could potentially increase with minor investment in irrigation technology or machinery. What role does acceptance play in people’s choice of strategy? Does it matter more in some cases than others? These are the types of questions that should be asked when designing adaptation strategies. Policies and projects on adaptation need to encourage acceptance of the fact that life will change dramatically for many. This needs to be accompanied by overt recognition that for those who have yet to attain a decent level of wellbeing, their path there may now be longer, even non-existent. Resilience, in its least flattering conceptualization, suggests maintaining the status quo. That can be seen to contradict the need for acceptance of change. Mainstreaming the idea of integrating climate change into policy implies that business-as-usual can just continue as long as climate change is taken into account, which may or may not force people to accept that some change will be extremely dramatic, and that there are limits to how effective mainstreaming can be. Transformation, which demands the greatest change of the three ideas, could possibly involve acceptance. After all, people have to accept a new pathway implied in the idea of transformation. When the United Nations Framework Convention on Climate Change was written in the early 1990s, it focused on reducing greenhouse gas emissions. The science of the time considered that the problem could be contained before it got so big that the changes would actually be experienced. Now, nearly 30 years later, there is widespread acknowledgement that actions have been too little, too late, and that the planet is locked into a certain amount of change, as noted in the recent IPCC special report, Global Warming of 1.5ºC. This suggests, to some degree, that change has been accepted. 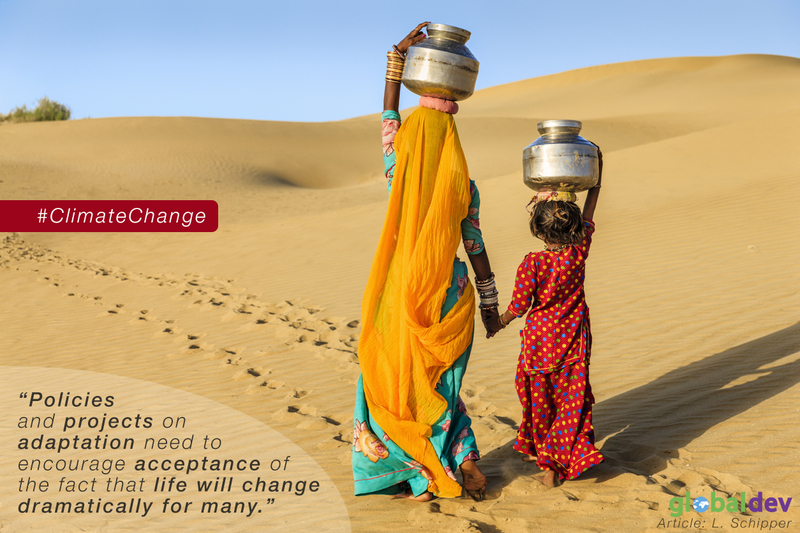 Yet many of the adaptation projects that are being funded still nourish the attitude that with just some small tweaks, existing livelihoods and lifestyles can be adjusted to meet the challenges of climate change. It is almost as if people are trying to avoid negative thinking, by blindly pursuing actions that provide a sense of hope that the transition of wellbeing into a changing climate can be made, without direct or indirect damage. Dr Lisa Schipper is an Environmental Social Science Research Fellow at the Environmental Change Institute at the University of Oxford. Her work focuses on the drivers of social vulnerability to climate change and natural hazards in developing countries, and the role that adaptation can play in reducing that vulnerability.